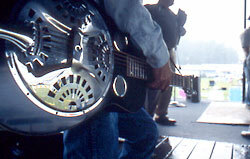 The North Carolina Arts Council promotes public knowledge and appreciation of North Carolina’s folklife and traditional arts through planning and producing special projects, publications, recordings and films; documenting living traditions; maintaining an archive of documentary materials and other resources; and assisting individuals and organizations through a grants program and technical assistance. Folklife Program staff plan and present special projects that have statewide impact. Museum development, festivals, touring programs, school programs, curriculum development, national conferences, and documentary sound recordings, films, and videos are examples of projects produced since 1977. Documentary materials resulting from these projects, including field notes, sound recordings, photographs and slides, and film and videotape footage, are preserved in an office archive and in the Southern Folklife Collection at UNC-Chapel Hill. A three-month Folklife Internship is offered every year to applicants who have completed at least one year of graduate study in folklife or related fields (ethnomusicology, anthropology, history, etc.) or have experience with traditional arts and culture. The Folklife Program is partnering with South Arts’ In These Mountains: Central Appalachian Folk Arts & Culture initiative to offer two Folklife Apprenticeships in 2019, 2020, and 2021 to eligible traditional artists in Appalachian Regional Commission counties. Folklife Apprenticeships support an experienced mentor artist and an apprentice for a year-long intensive learning experience in a shared traditional art form. Applications are due March 4, 2019 for the June 2019-June 2020 apprenticeship period. Participants must be 18+. A contestant waits backstage to compete at the Mount Airy Fiddlers’ Convention. Photo by Cedric N. Chatterley for the Blue Ridge Music Trails project. Cherokee Heritage Trails presents the traditions of the Eastern Band of Cherokee Indians. Amanda Swimmer builds her pots in an old style starting with coils of clay and applies designs with a carved paddle. 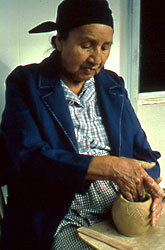 Her pottery is exhibited and sold at the Qualla Arts and Crafts Cooperative, a site on the trail. Photograph by Cedric N. Chatterley. 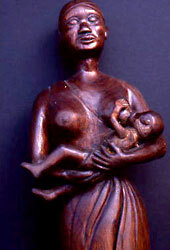 Mother and child by woodcarver and heritage award recipient George SerVance of Thomasville. Photo by Cedric N. Chatterley. 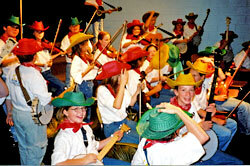 These young Sparta School performers from Alleghany County are Junior Appalachian Musicians (JAM), an after school music instruction program taught by traditional stringband musicians. Begun at Sparta School, JAM programs now operate in seven Western North Carolina counties. Photo by Helen White. 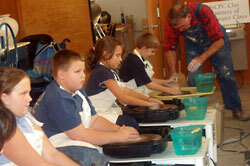 Fifth generation Seagrove potter Sid Luck teaches Seagrove Elementary School fourth graders how to turn pots on a wheel at the neighboring North Carolina Pottery Center.